For more than 50 years, John Deere and Company has been producing riding mowers for home and property owners, giving them pieces of equipment that are suited for nearly any lawn care project. Over this period of time, the company has introduced hundreds of models, each built with customer needs and concerns in mind, playing a significant role in simplifying yard work and keeping lawns and gardens in peak form. Have you ever seen a John Deere riding mower and wondered, what year was that made? Or, is there a larger version of that model? While answering every one of these questions that come to mind would be a major challenge, we want to provide a series of posts that go back in time and take a decade-by-decade look at John Deere riding mower history. 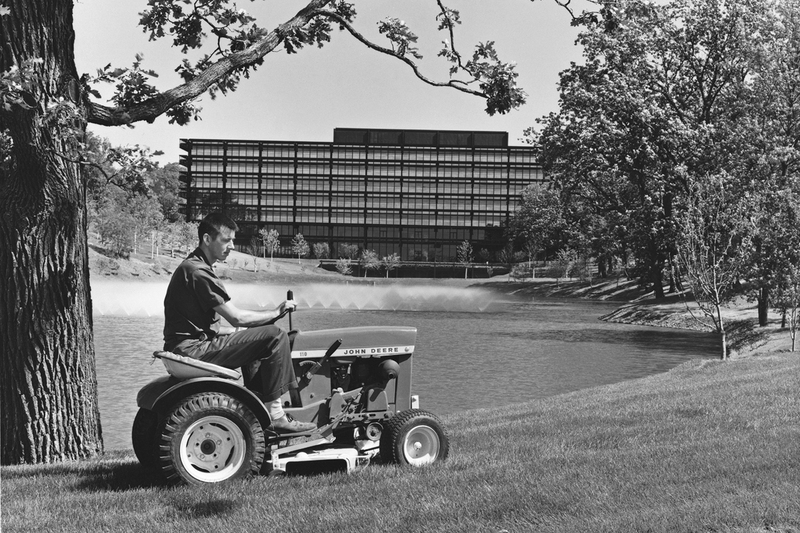 In our first post, we’ll examine Deere’s 1960s riding mower roots, a foundation that has led to today’s innovation. Laying the foundation: John Deere broke into the lawn tractor market in 1963, with the introduction of the model 110, in Horicon, Wisconsin. The four-stroke petrol-fueled engine aboard produced 7hp and capitalized on the growth of lawn mowing, which was becoming a popular leisure activity at the time. The John Deere 110 incorporated many of the same features and wide range of implements that Deere’s bigger farming tractors offered. Thanks to its ergonomic design and features that were ahead of its time (such as Variable Speed Drive), the 110 became a big seller. Building on success: Following the astounding success of the 110, Deere introduced their 112 model, which carried the same styling as the 110, but with a larger motor and wider deck. The 112 was designed for those that needed a mower for slightly larger jobs than the 110 was capable of. Following this trends, Deere also introduced the John Deere 140, which was known for having a lot of power for such a small machine. With a 14 hp Kohler engine and hydrostatic transmission, the 140 was capable of accomplishing all kinds of yard work. 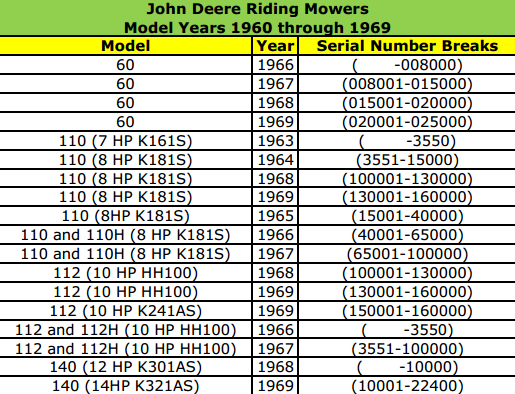 See the image below for a complete list of riding mowers by model, year, and serial number. Next time you hop aboard your John Deere riding mower or drive past one in action, don’t forget to think about the foundation it was built upon in the 1960s. Be sure to look out for our next post in the John Deere riding mower history series as we will take a look at innovation introduced by Deere in the 1970s!